Terence Parr, October 31, 2002. The jGuru server is the culmination of 3 years of experimentation and frantic implementation. These notes summarize how jGuru's design and implementation changed over time from a slow, cranky, and unreliable website to an extremely fast, stable, and popular website for Java developers. I do not discuss how the software is implemented; I focus on the overall system configuration and design. Thanks to the Wayback machine at the Internet Archive, here is a visual track of the jGuru "look-n-feel" including links to the archived pages ( See whole archive). Multiple Sites and multiple "skins"
jGuru can pump out multiple websites (called "multi-tenant" system now) using the same server (same Java VM process). Here is a list of different "tenants" viewing subsets of the same data. Each site can have a different landing page (faq index page for BEA, webGAIN) and can see a different list of topics. jGuru had different "skins" for guest, user, and premium users. Note that the premium site has one gutter. BEA has two on the left. webGAIN has two (on opposing sides). We had a random collection of dissimilar boxes running various flavors of linux (redhat). The software had config interdependencies like crazy (and between versions). Heck JSP syntax changed TOTALLY during our use of it. I built a script to convert it. We had multiple versions of the software on each machine. Then used a sym link "knob" to switch between dev branches, release branches, test branches, and of course the live server. The Perforce revision system was used to deploy software. In other words, I would go to the web server and say "sync with repository" and hope for the best. Apache was our http server but since we had nothing but dynamic JSP pages, apache served no purpose other than to invoke gnujsp via jserv. The epicentric portal server managed our users and provided the basic functionality. You could configure which little window-like boxes (news, faqs, ...) you wanted on your pages. Epicentric insisted we use mysql, which couldn't do transactions, hence, for our data (faqs mostly) we bought a SOLID database. Excellent and simple. Backup is "copy a file". The web server communicated with the SOLID database via an English and xml-based ENTP (Entity Transfer Protocol) client that talked to an ENTP server on the database machine. The results of queries were cached. Since queries always differ slightly, there was lots of repeated data and the cache had to be big to get good performance. Eventually we purchased Thunderstone's search engine. That was slow to spider our site, as in days, due to the inefficiency of the site and inefficiency of going through HTTP to get data. [Current system does it in 20 minutes]. We had a javadoc API searcher that was semi cool; used another (local) copy of SOLID to hold the info. Written by an "intern". We had an ENTP (Entity Transfer Protocol) server answer queries from the web server. If this was down, the web server would freeze. The schema was such that queries took forever sometimes (as in an hour). I had each property of a Java object mapped to its own table in the database rather than all the single-valued properties in one table and then one table per multi-valued properties. I believe we copied the database to a backup "hot swap" database every hour so we'd lose at most 1 hours worth of data if everything died. Main database server was a RAID disk though. To install a new system, we manually configured, compiled, set property/config file values etc... No rpm to just dump stuff on a system. Computers were different too. Some directories were different or whatever (different redhats). This process took 4 hours once you had done it 3 or 4 times. Never went smoothly though. 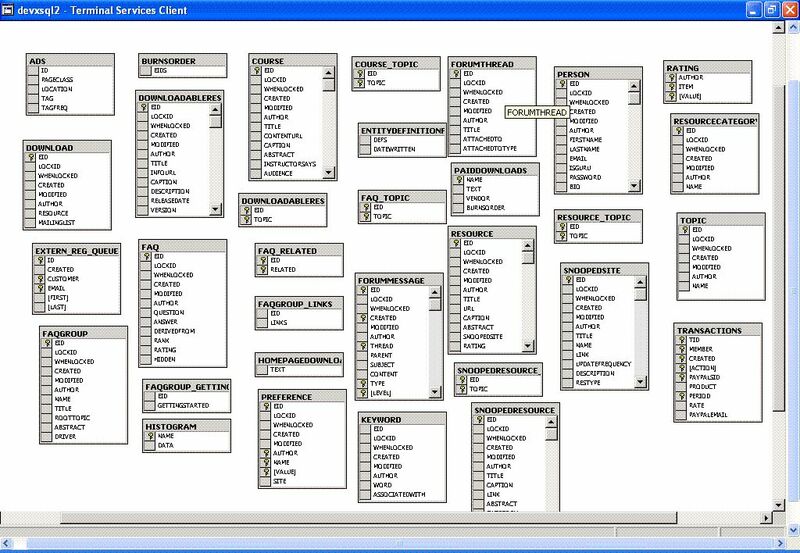 Sys admin wanted data grouped by static vs changing data rather than logically like "apache", "db", etc... This is madness because when there is a problem with apache, I want to jump to an apache dir and then look at the logs, config, etc... Worse, it was hard to put the config files into the repository since lots of it had to live up in /etc/rc.d/init.d etc... (not under the perforce root). Used lots of sym links pointing all over the system. Also, because we used RCS to deploy and didn't have RPMs for system components, we were tempted to modify software on web/db servers, rendering our boxes slightly different. Should be deployed as readonly systems. You had no confidence that "because it works on the test box, it will work on the live server". How do I remember all this old info? I have notebooks (text files) used to record experiments and communicate things to others and myself (in future). We had telnet open, bind, sendmail...everything. Got hacked at xmas one year because someone snooped my telnet session. As things turned out, I ended up writing the entire second implementation of jGuru. The old system had decayed so horribly internally that we needed to completely rewrite the system. Experience with Epicentric and also JSP led us to believe we should dump them, necessitating construction of lots more software. This system, a dual 800Mhz 1G RAM linux redhat 7.2 box, is mostly idle with spurts of heavy Java and database activity occasionally as the software reloads data into the services like FAQManager. Currently we have only ports 80 and SSH open to our live server at Rackspace and SSH only accepts connections from behind the firewall at our dev network. The dev network in turn has NO ports open. None. Makes for a very tough nut to crack. Amazingly, we have boiled down jGuru to only a few system components. Further, everything is in Java now except for the SOLID database, reducing our system dependencies and configuration hassles tremendously. Technically speaking we could deploy with a whopper of a jar file once Java and the DB were installed. When bringing the new Rackspace boxes online, I made a "human script" that turns off all the major security holes; now it takes only a few minutes to execute. From there, I install the JDK, SOLID (optionally with data), and resin RPMs. To get the software on the live box, I "push" using rsync from my dev box to the live server. This guarantees that the live server is "identical" and that I won't be tempted to mess with the server config, making the two systems diverge. Everything minus the security lock down is automatic and quick. When the software starts up, it senses its environment and builds directories, search databases, etc... if necessary. I have moved cron-type jobs (stuff that runs periodically) into Java as well to avoid having to set up OS crontabs and the like. From a box offsite, I run a backup script (cron) that pulls the db over daily to another hard disk. Logs as well. I also run statistic generating scripts on this box. Developing big programs is just a big fat mess. You are constantly making decisions with incomplete information and then having to live with the consequences far into the future. The most important bit of advice I can give you is that you should write software with this in mind. Don't optimize early or get too smart about how the future will go. On the other hand, you can't make your software too brittle. You'll regret it. If the market doesn't change your direction or target for you, your boss randomly will. * determines what FAQ an entry goes with. *  was generated, but in principle it could be an article. Note that I let you use array notation and then the software automatically builds extra tables (using 3rd normal form or whatever it is) to handle the multi-valued property. query type FAQ props (question,answer) where "author=1"
Note that for the config files, I don't have to specify anything at start up...I just say "run!". It looks at the hostname to determine what family of sites to bring up. This is superior to having to say the right thing.